E-Mail Marketing: The Complete Guide to Creating Successful Campaigns. Herschell Gordon Lewis. AMACOM. 304 pages. $24.95. Let's check our e-mail. Hmm. . . In addition to a few messages from clients, colleagues, managers and readers, there's a solicitation from an heir of an overthrown African politician offering a "business opportunity" (but he wants my bank account number to get started); a sale on toner cartridges from a company I've never heard of; several links to pornographic websites; an offer to purchase a condominium in Calgary; a number of cryptic messages with attached files (removed by my company's virus prevention software); poetry from a local writer; a newsletter; a few more commercial solicitations (some of which pretend to be responses to inquiries and requests I've never made), and a bunch of other things that were routed directly to the trash, since they contain certain keywords that flag them for that purpose by my e-mail program. So what's the deal with the unsolicited commercial e-mail — fondly known as "spam"? You and I may consider it spam, but e-mail as a marketing tool is a powerful new medium. Herschell Gordon Lewis is one of its biggest advocates, and that makes sense. Lewis, a Fort Lauderdale-based advertising veteran, has long been a creative guru in the direct marketing arena. To some, it's mere junk mail, but Lewis cast his sharp eye toward the creativity and effectiveness of the work, mostly stuff that appeared in his own mail box. His long running column in a trade publication wittily skewered a number of ill-advised campaigns and sales pieces — and complimented a few that worked, in his opinion. In this new book, he does the same with the sales pitches and special offers sent to the in-box of his e-maile account. If you're an average recipient of e-mail who's annoyed by the endless amount of unsolicited commercial messages, this is not the book for you. No way, because Lewis assumes that there is such a thing as good e-mail of the unsolicited commercial variety. And really, if you think of it as a digital cousin of the material that shows up in your home mailbox every day, this is not a difficult leap to make. But if your home is assaulted with dozens of daily come-ons for hot farm girls, Viagra and other unwelcome products and services, chances are you'd have negative feelings attached to these solicitations. Lewis apparently believes that since e-mail is, after all, in its infancy, the bad things will fade away as the medium matures. And, if these offers cease being effective (the marketing, not the products! ), senders will stop flooding every e-mail address with it. The problem, of course, is that conducting e-mail marketing campaigns is cheaper than any other similar effort, so the bottom-feeders will probably be around forever. But that's not our problem, nor is it Lewis', other than factoring it in to the effectiveness of e-mail marketing as a whole. He's not an advocate of spam; he just thinks it is, for the most part, lame. Instead, he's a proponent of sending messages to prospects who are disposed toward particular products and services, have opted to receive e-mail, or are on lists supplied by companies gathering such information to sell them to companies in the same manner as traditional (postal) mailing lists. So Lewis devotes most of his book to discussing his general creative principles and showing how they apply to this unique medium, illustrated with plenty of real examples from the things he has received. 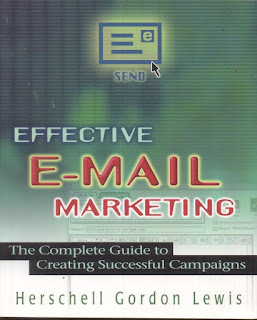 If you are so inclined to conduct an e-mail marketing campaign, this book is invaluable. Writing may be deceptively simple, but crafting a message in a powerful and persuasive manner is extremely difficult. Herschell Gordon Lewis is a Jedi master of mail marketing -- snail or electronic -- so heeding his lessons all but guarantees success. But please, don't give into the dark — and spammy — side of The Force.